ABSOLUTION has been holding steady throughout the dire month of January, despite obstacles. Now we are into February when temperatures and numbers will climb even more. We have been on an amazing journey, through 5 venues, 3 seasons and more DJs than we can count! The evolution of a party is a very interesting process that reveals many things- trends, and also friends. Thank you, loyal and true friends, for sticking in there with us-you know who you are. We are now sharing the goodness that is a mature party, which has a very distinct feeling when you walk in the door. Good cheer, energy and the Bacchanailian spirit that overtakes partygoers worldwide. It's time to have fun! 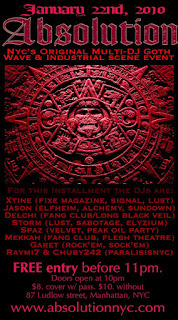 We have also begun the task of building a Monday Gothic night called ÆLFHEIM at FONTANAS, 105 Eldridge St. Much of the groundwork for this party has already been done, as DJ JASON has done a Monday night party for 10 years previous to this which was called ALCHEMY located at CBGBs GALLERY. Monday Gothic Nights in NYC are back. Filling slots for this Monday band night, I was reminded of the fact that I would like to rebuild my own band project, BLACK EARTH. I am going to be auditioning members in the coming month. BLACK EARTH is a GOTHIC METAL project which is inspired by Nightwish, Within Temptation, Epica and others. I want to thank all of you for your continuing support of ABSOLUTION. Last week, Jan. 15th 2010 was our best night yet in our now permanent venue, UC87. There were a lot of new faces there- welcome, everyone! We also welcome to the ABSOLUTION team beautiful FOREST, the winner of the Go-Go audition- soon to be joined by more talented and beautiful dancers. ABSOLUTION- putting the talent back in Goth/Industrial! No corniness- Goth is not a comedy show or a place to act like you're 13. This is Manhattan, NYC, coming straight from the Gothic Underground. We are pleased to announce that in addition to finding a permanent home for ABSOLUTION on Fridays, UC87, we will also be opening a weekly Monday night at FONTANAS, where we previously held ABSOLUTION. The night will be called ¯ÆLFHEIM GOTHIC MONDAYS. We decided that FONTANAS is the perfect place for a Monday night featuring bands and the DJing of Jason, just as he has been doing for the past 10 years. Some people think that 8 parties per month is a lot of work! We think it's a lot of work too, but NYC is worth it. Furthermore, it's the same job that Jason and I have been doing for over 10 years. We are just doing our jobs:). Also, it doesn't feel like work if you love it.